Scottish musician/vocalist Thomas Leer made some of the most interesting song-based electronic music of the original post-punk era, but he’s never achieved much more than cult status. In all honesty, though, he should be as well known as Soft Cell, if not as widely loved as New Order, to name only two contemporaneous UK acts. 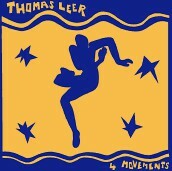 4 Movements was the first Leer release I heard, and it remains my favorite to this day, although Private Plane EP and the Contradictions LP are also highly recommended. As another British group, Hot Chocolate put it, every 1’s a winner. 4 Movements‘ opener, “Don’t,” is a gleaming jewel of continental dance music overlaid with Leer’s elegantly pained vocals. It strikes you as accessible and danceable synth pop on one level, but there’s something deceptively complex happening under the surface: a sneakily wiggly bass line, frosty and fibrillating synth whorls, spectral backing vocals… or are they yet more synths? Whatever the case, you’re paying close attention and working up a sweat. “Letter From America” shimmies into earshot with a quasi-cha-cha rhythm and an exotic array of synth tones, which elevate this song into the vicinity of Haruomi Hosono’s all-time stunner, Cochin Moon. Perhaps the EP’s most poppy cut, “Letter From America” finds Leer singing with a seething, Howard Devoto-like suavity. “Tight As A Drum”—which bears a vague resemblance to David Byrne and Brian Eno’s “The Carrier” from My Life In The Bush Of Ghosts—is staunch, five-dimensional dub in a hall of illusory synth mirrors—very disorienting. I love to play this track at DJ gigs and watch people try to make sense of it. The final track, “West End,” slithers with a silvery, slick rhythm and bursts with tightly controlled, ecstatic synthetic horns. Again, there’s a lot of subliminal sonic sorcery going on: contrapuntal synth lines, bizarre burbles and ripples. It’s like a new kind of snake-charmer music, and it’s incredibly sensuous.